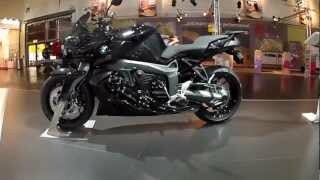 The BMW K 1300 R ✅ or rather BMW K1300R is a modern Roadster or Nakedbike. Compared to the completely covered version K1300S the K1300R has a higher handlebar. The engine is the same, a 4-cylinder in-line-engine, this time with 173 HP and 140 NM which is brought forward to the rear wheel by Kardan. From there it speeds up the 243kg.